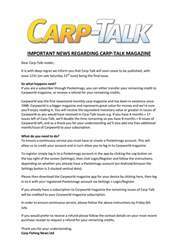 This week’s issue of Carp-Talk (issue 1229) is available to download now! The recent spell of warm weather seems to have put paid to angling on many venues, due to spawning fish, however several venues are still fishing rather well. The largest UK fish of the week fell to John Igglesden, who banked Butthead from Girton Pit at 56lb 5oz on his first ever session. 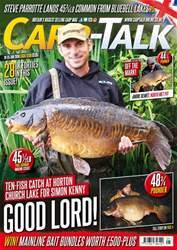 On Monks Pit in Cambridgeshire, Ian Bailey made it two Most Wanted carp in this issue, as he landed Porky at 51¾lb. Down in the garden of England, Carl Milton dropped onto Strawberry Fields and was rewarded with a 52lb 1oz common. RidgeMonkey’s Chris Cox gives his views on the latest products from the RM-Tec range while Dynamite’s Pete Castle details his favourite methods for surface fishing at this time of year. 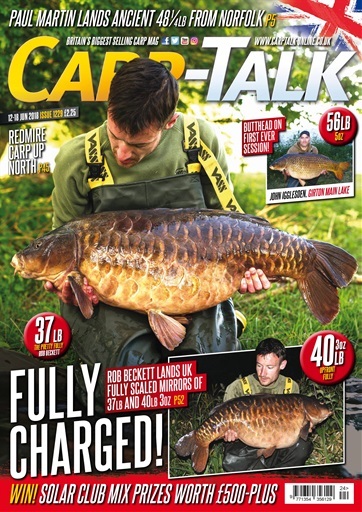 This week’s cover star, Rob Beckett, reflects on the capture of two very special fully scaled mirrors while Rob O’Brien visits the popular day-ticket venue East Delph Lakes for a spot of surface fishing. 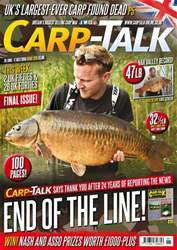 Mainline’s Wayne Mansford looks back on a memorable trip to one of Embryo’s new venues and our very own Simon Crow is back with his column, talking about an intimate lake containing just five special Redmire-strain carp! We have over £500 worth of Solar’s Club Mix goodies up for grabs, plus the winners of the Mainline CATOY weekly prizes are revealed.